Kawasaki’s own Team 38 is hoping to find out just how fast a Ninja H2R can go when it takes one to the 2016 Bonneville Speed Week event. The team had planned on running the bike at Bonneville last year but because water had submerged part of the course, the event had to be cancelled. The team took the bike to the “Mojave Mile” event instead, and although the bike reached a top speed of 348.2 km/h, they felt the limited distance at Mojave wasn’t enough to really show off the machine’s ground-breaking speed. This year the Bonneville Speed Week course will be 8 km long, and with considerably more distance to accelerate than the Mojave Mile course it should give the Ninja H2R a chance to show its full capabilities. The bike has a standard H2R engine (243 kW) but has modifications to the chassis and bodywork. The front fairing has been modified to make it a fully flat surface, it has an oversized front fender and the upper and lower wings have been removed. It also has a modified chain cover to meet event regulations, a modified rear sprocket and aftermarket Dunlop Sportmax GP-A Pro tyres. The bike has been prepared by Team 38, Kawasaki’s own “in-house” race team. Team 38 began when a group of like-minded Kawasaki employees and test riders got together to form a privateer racing team in 1975. The team’s name came from the place where the employees worked – the Experimental Technology Department’s building, Number 38, at the Kawasaki Heavy Industries Akashi Works plant. 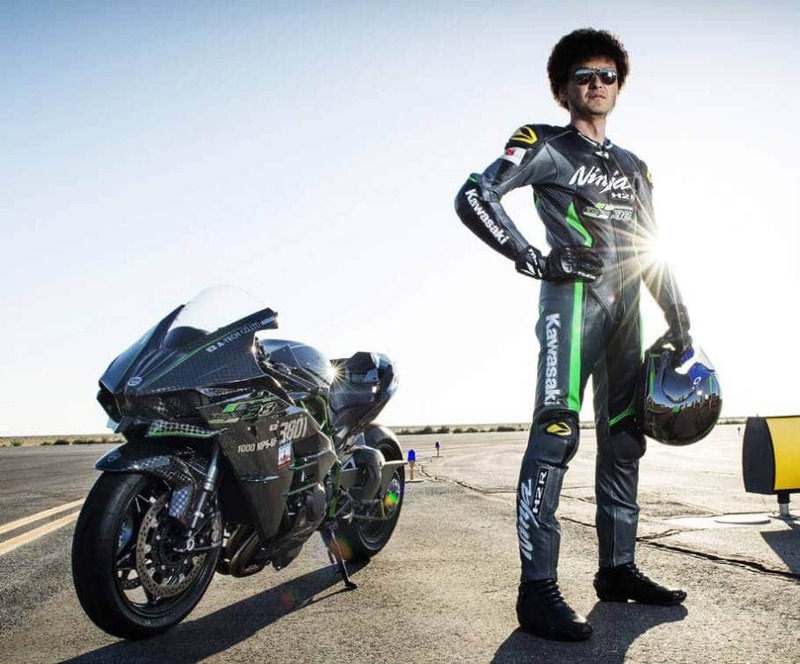 Shigeru Yamashita with the Ninja H2R. The team’s rider is 46 year old Shigeru Yamashita. He was hired by Kawasaki Heavy Industries as a test rider in the Experimental Technology Department in 1989. He now has 27 years experience as a test rider, and has entered the prestigious Suzuka 8-Hour Endurance Race nine times. Bonneville Speed Week is the world’s most well-known and influential top-speed contest, and is held on a massive dry salt lake in Utah. This year’s event will take place from 13th to 19th August. The post Kawasaki To Take Ninja H2R To The Limit At Bonneville appeared first on Motorcycle Life. Next story Will The New Indian Flat Tracker Lead To A New Production Bike?